Pre-registration is required for attendance. Class fee includes all materials. 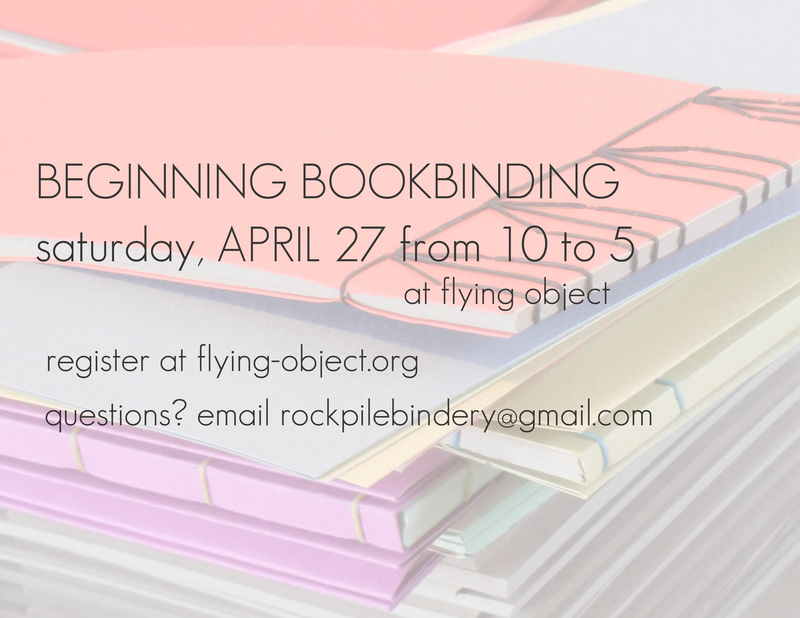 Register at flying-object.org. 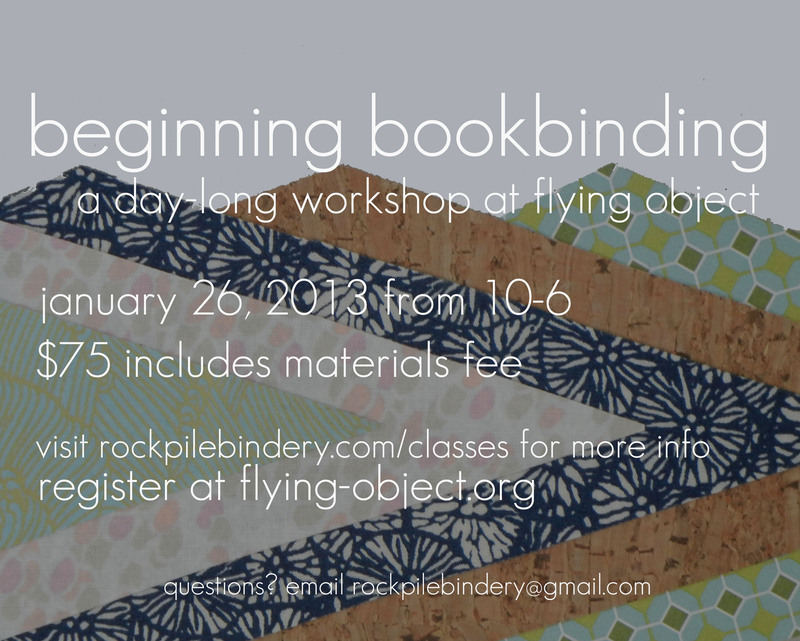 Please contact Jean at RockpileBindery@gmail.com with any questions. 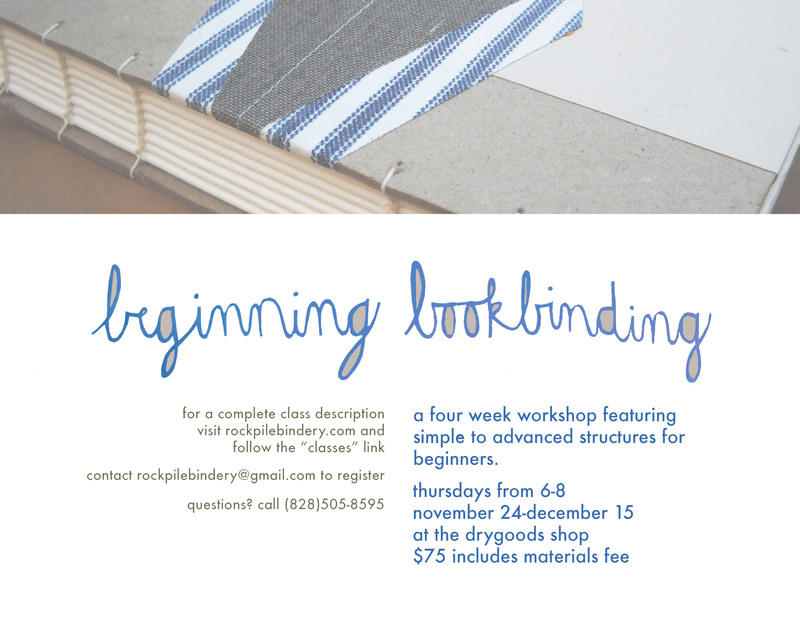 This class focuses on binding techniques that can easily be reproduced at home with basic bookbinding tools and easy to find materials. Each week, students will learn one or two bindings, and will leave the three-week series with five finished books. All materials are included in the class fee and tools can be purchased at cost at the end of the class. 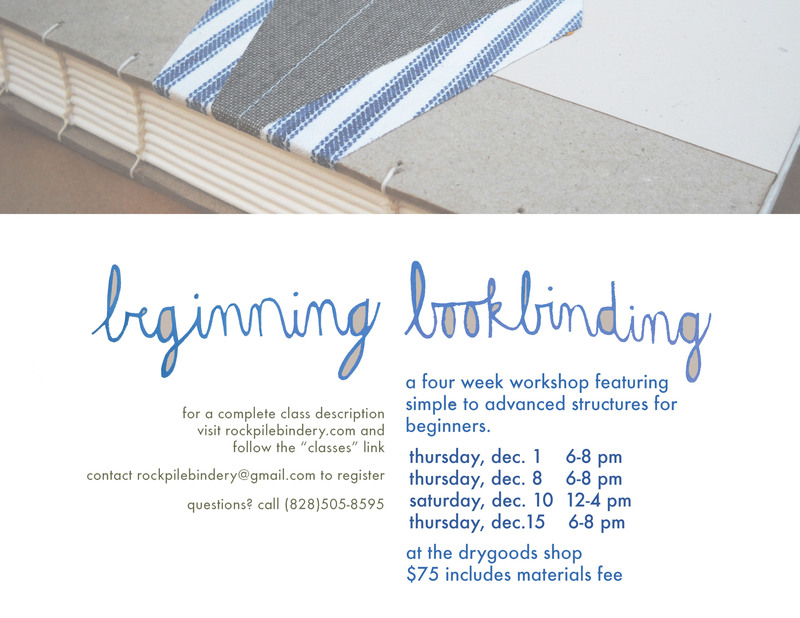 This class is appropriate for beginners and those with some bookbinding experience. 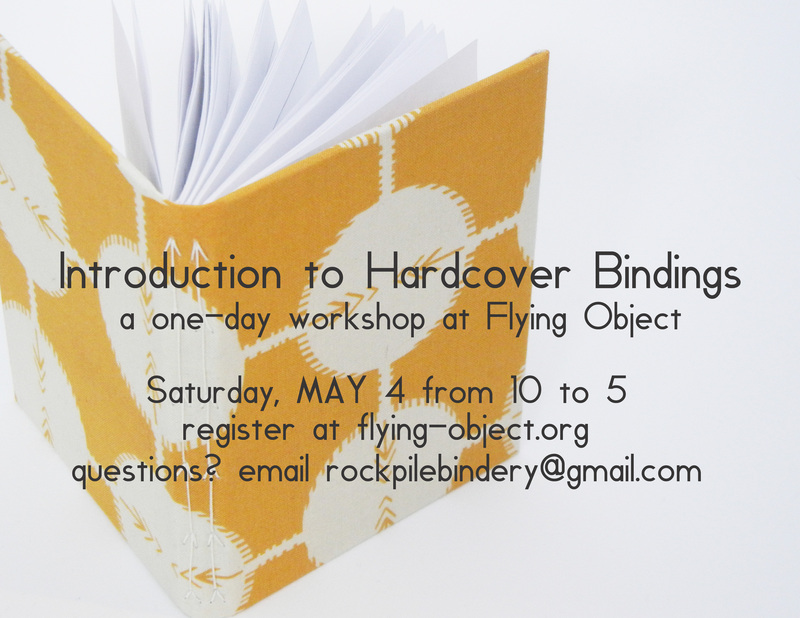 In this class we will explore a handful of bindings that can easily be reproduced at home with a few simple tools and easy to find materials. We will also learn techniques that work well with recycled and found materials. 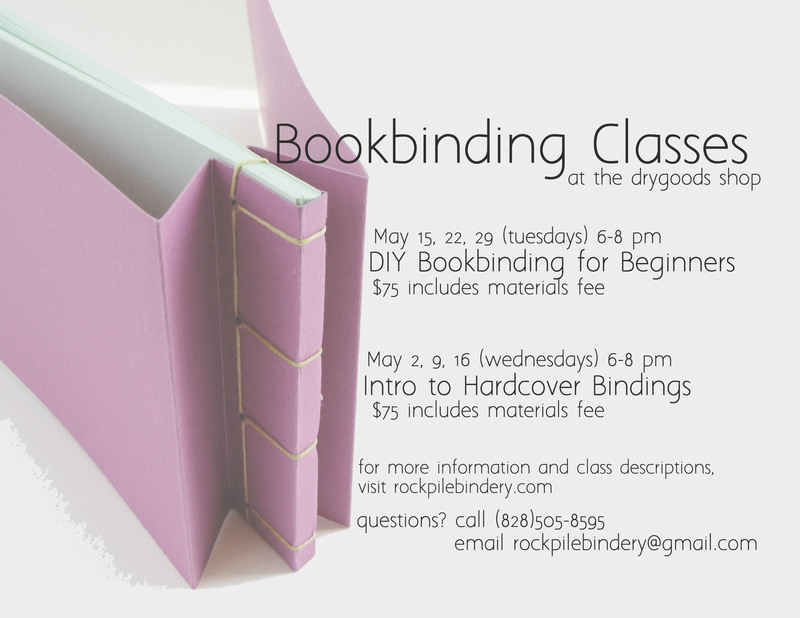 The class is appropriate for beginners and those with some binding experience. All materials will be provided and tools used can be purchased at cost at the end of the workshop. 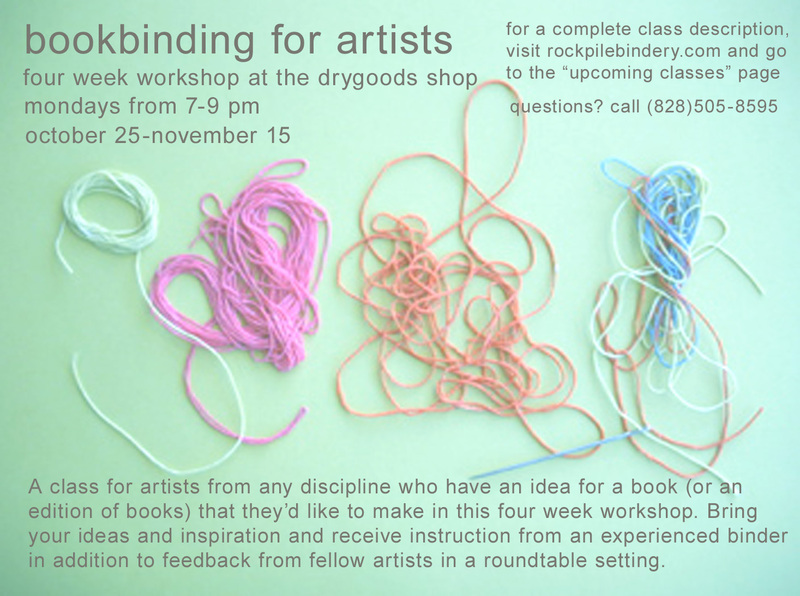 Contact Jean Potter at RockpileBindery@gmail.com or The DryGoods Shop at (828)505-8595 to sign up. Please pre-register for classes! 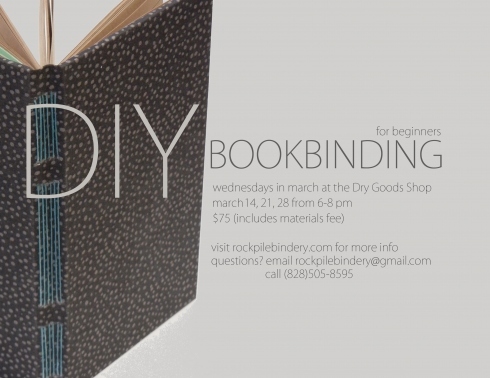 Learn to make a variety of hardcover books in this three week workshop. All materials will be provided, and students will complete three different structures over the course of the class. 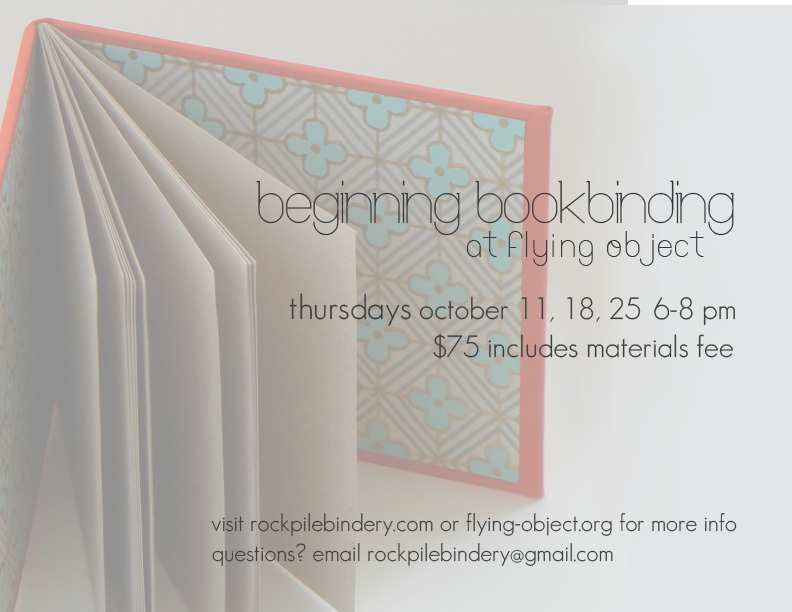 Although this workshop is appropriate for beginners, it is best suited to those who have some knowledge of bookbinding tools and materials. 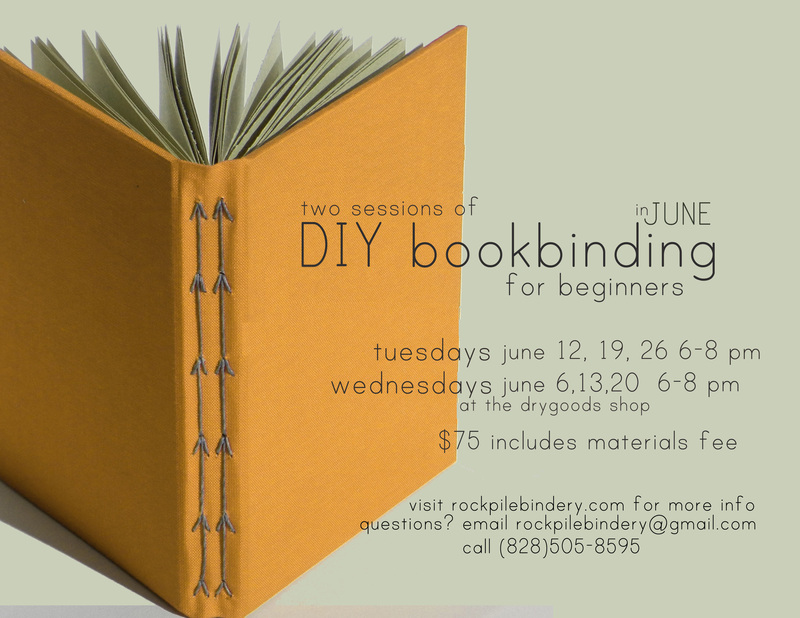 Contact Jean Potter at RockpileBindery@gmail.com or The DryGoods Shop at (828)505-8595 to sign up. Please pre-register for classes! Minimum enrollment for class to run is 4 students. 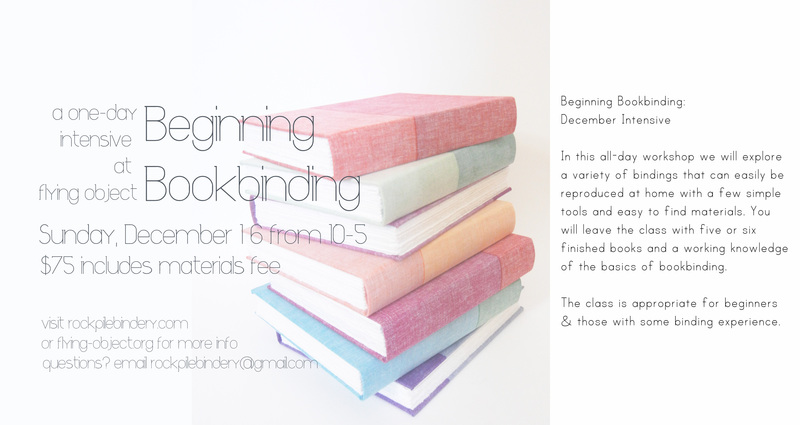 In this four week workshop we will explore traditional and experimental bookbinding methods appropriate for beginners. All materials will be provided and tools used can be purchased at cost at the end of the workshop. 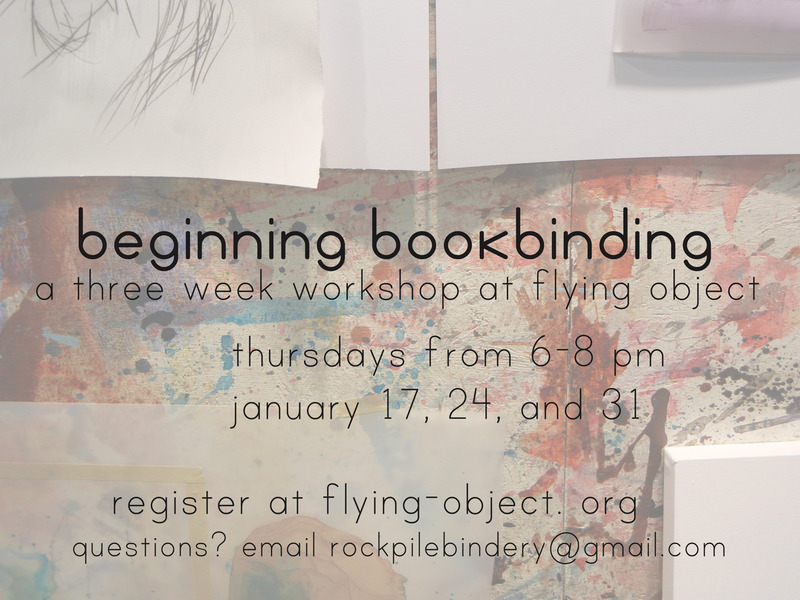 This class is for artists from any discipline who have an idea of a book (or an edition of books) they’d like to make in this four week workshop. We will begin by sharing our ideas with the group, looking at several bookbinding structures, and deciding which structure best suits each artist’s concept. Each artist/student will be responsible for purchasing his/her own materials, which will be determined once a book structure is chosen. 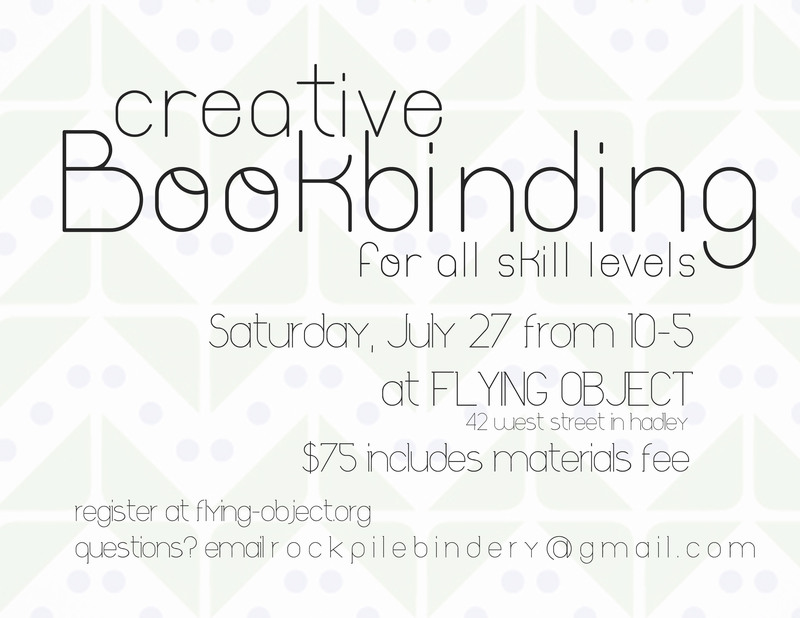 The instructor will provide resources for inexpensive materials, including found/free stuff. Cost of materials will vary from person to person. A lot of class time will be spent on instruction, brainstorming, troubleshooting, and discussion. Students will have the opportunity to use open studio space during business hours at the DryGoods Shop. For most book structures, time outside of class will be required to finish a book or set of books. Each week when we meet, we will look at progress on individual projects, answer questions, and have studio time.